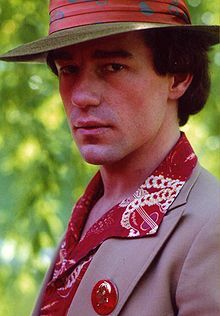 Encino, Los Angeles, California, U.S.
Phillip Edward Hartmann (known professionally as Phil Hartman; September 24, 1948 - June 24, 1998) was a Canadian-born American graphic designer, artist, writer, comedian, voice artist, and actor. Hartman was born in Brantford, Ontario, Canada and he then moved to the United States with his family at the age of 10 and then became an American citizen in 1990. Hartman was a cast member of Saturday Night Live. Hartman was born Philip Edward Hartmann on September 24, 1948 in Brantford, Ontario, Canada. He was the fourth of eight children of Doris Marguerite (Wardell) and Rupert Loebig Hartmann, a salesman specializing in building materials. His parents were Catholic and raised their children in that faith. As a middle child, Hartman found affection hard to earn and stated: "I suppose I didn't get what I wanted out of my family life, so I started seeking love and attention elsewhere." Hartman got his start in show business as a performing member of the comedy troupe, Groundlings. Hartman then joined the cast of Saturday Night Live in 1987, and stayed on the show for 8 years. Hartman also did prominent voice acting roles on The Simpsons until his untimely death in 1998. He was also part of the main cast on the critically-acclaimed sitcom News Radio, until his murder. Hartman, before becoming an actor and performer, worked as an album designer and graphic artist for multiple rock bands such as Poco, America and Crosby, Stills and Nash, while also co-creating the signature logo for the latter group. Hartman had also co-created the character Pee-wee Herman together along with his fellow Groundlings member and associate Paul Reubens. Hartman also co-wrote the screenplay for the film Pee-wee's Big Adventure. He had also appeared in multiple films such as Coneheads, Kiki's Delivery Service, Cheech & Chong's Next Movie, House Guest, The Pagemaster, Small Soldiers and Jingle All The Way, among many others. Hartman was also a prolific voice actor who had voice roles in several cartoons, such as Scooby Doo, The Simpsons, Happily Ever After: Fairy Tales for Every Child, Darkwing Duck and The Smurfs. One of Hartman's last notable projects was in the 1998 video game Blasto, released for the PlayStation. On May 28, 1998, while he slept in his bed, Phil died at the hands of his wife, Brynn Omdahl-Hartman, by a revolver. Brynn, intoxicated and under the influence of cocaine and alcohol, drove to the home of a friend, and confessed to the murder. Returning to the house, with the couple's two children asleep inside, Mrs. Hartman pulled to gun to her head, and ended her life. Phil Hartman was cremated days later, with his ashes spread over an island off the coast of Southern California. The Hartmans' two children, Sean Edward Hartman (born on March 20, 1987) and Birgen Anika Hartman (born on September 20, 1989), were raised by their aunt and uncle, Katherine Omdahl (Brynn's sister) and Michael Wright in Minnesota. ↑ V. Harris, Lyle (29 May 1998). "Phil Hartman: An appreciation – he became anybody he wanted". The Atlanta Journal-Constitution. p. F01. ↑ "You Might Remember Me - Mike Thomas - Macmillan". US Macmillan. ↑ Tresniowski, Alex (15 June 1998). "Beneath the Surface". People. Retrieved 6 October 2008. Wikimedia Commons has media related to Phil Hartman. This page was last changed on 15 February 2019, at 12:45.